Main presentation "The Construction of a Letter"
-The presentation should clearly present the planning and thought processes that go into the writing of your particular type of letter. -You are welcome to divide it up into parts so that each person has an equal amount of time to present. (This is to make it easier because you do not get chance to see each other often during evening classes). You do not have to follow this presentation style...you are welcome to present in any way you wish as long as it follows the title "The Construction of a Letter." -You are free to choose which letter features you cover. -The topics you focus on (layout, style, techniques, how formal it is etc. are down to you. Just try to be clear in explaining why you made those choices when writing your letter. 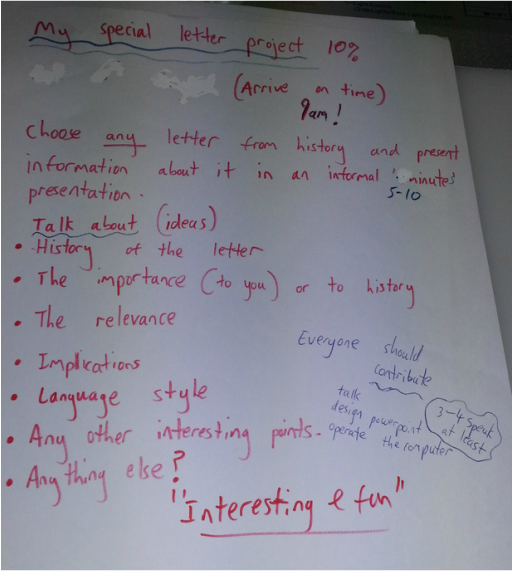 -It is recommended you show an original letter that was written by your group as an example of what you are trying to demonstrate. "My Special Letter Project" is the title of the project. The tips below are merely a guideline. Points will be given purely on how "Interesting, informative and how fun" it is. Don't choose comedy letters or anything from Harry Potter. Something historical or real is better. We will arrange the times on the day so please come prepared and ready to present. If you don't have anything to present then you will get 0. Have fun and enjoy this! You are only allowed to miss 1 class. If you miss more than that you are not eligible to take the final exam (according to the recently enforced IIS rules). Please speak to the office if you need more information about it.